I have a very vivid memory of sitting in one of my business management diploma lectures, that I was taking with my work colleagues, absolutely convinced that I knew the answer to the question the lecturer had posed. But I was so terrified of getting the answer wrong and looking stupid in front of everyone, that I simply couldn’t summon up the courage to answer. Someone else had a go and got it wrong and I remember feeling so convinced that I knew the answer, but something inside seemed to be physically stopping me putting my head above the parapet. Internally, I was having mental fight with myself to be bold enough to stick up my hand. But I didn’t. No-one else knew the answer and so in the end, the tutor told us. It was the same answer that I’d so desperately wanted to say but had not been brave enough to verbalise. So scared was I of failing. I’m embarrassed to confess this, but one of my strongest internal drivers is for everything to be perfect. The advantage of this is that I always strive to do my best and aim for good quality in whatever I do. The disadvantage is that I have a fear of failure and losing control. And sometimes this fear holds me back. Occasionally, it stops me from trying new things. I’ve learned to blag my way through topics of conversation which I don’t understand or steer them in a different direction, never wanting to admit to my lack of knowlegde, being so ashamed of my ‘perceived ignorance’. And in the process of trying to maintain this image of being an ‘intelligent individual’, I’ve missed many learning opportunities. Not such an intelligent move… Hard to admit, but essential if I want to grow and not let my children be negatively affected by my own limitations. I suspect I’m not alone in this desire to be perfect and not fail. In fact, our current educational system, with its constant rounds of assessment, testing and placing children into boxes according to some highly limited set of success criteria, fosters this negative belief system in our children. It rewards those who can play the system, answer the questions in the way they’re supposed to and achieve fantastic grades. Not say ‘stupid’ things or ask ‘silly’ questions. Be perfect. Don’t challenge the status quo, but do perfectly on the challenges you’ve been set. I was one of those students and it’s only now that I’ve realised how limiting my education was. No-one taught me that it was not just OK to fail but actually critical to the learning process. I was recently listening in to the children’s audiobook: Great Inventors and their Inventions. Hearing the collection of individual stories of these extraordinary minds who have profoundly impacted our lives, not only was I taken by the fact that so many had been homeschooled, but also by the fact that they were all allowed the time and space to fail, and fail again, repeatedly. No-one belittled them for their mistakes and so they weren’t seen as a negative, but instead an opportunity for learning something new. Something which would help them get a step closer to their goal. And through their failed attempts, they would all, from Johannes Gutenberg to Thomas Edison, eventually design life changing inventions. “I think and think for months. For years. Ninety-nine times the conclusion is false. The hundredth time I am right.” Albert Einstein. Making mistakes is not only important in showing us what doesn’t work and thus aiding our discovery as to what could be effective like the examples above. It also allows us to develop empathy and compassion as we learn to appreciate that we’re all fallible, and therefore makes us kinder and more patient to others’ miscalculations. Furthermore, knowing that it’s OK to fail enables us to move out of our comfort zone and try new things for which we may end up having a real skill. Failing and failing badly can help us develop resilience and perseverance, giving us a chance to show grit and determination and develop a growth mindset. But only if we see failing as a positive thing, as a way to improve. Too many children have not learned to tolerate failure, leaving them vulnerable to anxiety, stress and depression. The pressure on children these days to achieve exceptional grades and not fail is causing an increase in mental health issues and incidents of self-harming in the UK, a trend which we can’t afford to ignore. So what can we do to help our children understand and capture the value of making mistakes and learning from their failures? Openly admit when you don’t know something. It’s nothing to be ashamed of and shows that asking for help, if you need it, is a great way to learn. Find the answer together and in the process, model independent learning skills. Also, talk to them about times when you have failed, how you handled the disappointment and what you learned in the process. Expose them to the reality that not everything in life goes to plan and often very positive things come out of what seems, at the time, to be a dire situation. When they get frustrated about not being able to do a question or work something out, empathise with their irritation, but then talk about the fact that if they got everything right, they wouldn’t be learning anything new. Reinforce that making mistakes is a positive experience, allowing them to identify what they don’t fully understand and enabling you to explain it in different ways/try alternative approaches to assist their learning. We recently went to a workshop at The Royal Mews, Buckingham Palace. The guide started off his tour by telling them that no answer was a bad answer and that he’d much prefer they have a go and get it wrong than to not try at all. That way, they’d learn a lot more. This set the whole group up for a lovely experience, in which all of the children were confident and comfortable answering his questions as well as posing many of their own! Have similar discussions with your children before they go into such situations to give them the confidence to try. Furthermore, at the end of each day, you could ask them what mistakes they’ve made and what they’ve learned from them. Make them something to be celebrated, rather than to be avoided. As parents, we often believe we need to protect our children from failing at all costs to safeguard their self-esteem. Far too quickly we jump in to help them with a piece of work/project/competition entry they’re working on or in a social situation we feel uncomfortable about. It can be incredibly difficult to watch your child fall. But if we don’t allow them to make their own mistakes, we’ll be sheltering them from experiences that necessitate problem-solving and develop resilience and which would ultimately give them the conviction and confidence they need to tackle new challenges in the future. Sit with them after the event and help them work out what went wrong and what they could do differently in the future, but don’t jump in and prevent them from making the mistake in the first place. 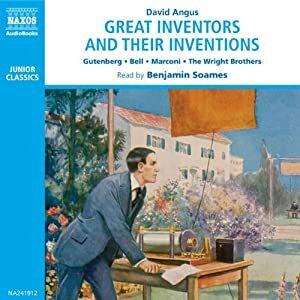 Listen to audiobooks like Great Inventors & their Inventions, More Great Inventors & their Inventions, and Great Scientists & their Discoveries together and discuss how important each individual’s failures were to their overall success. Read about examples of successful individuals who have failed at some point in their past, many of whom attribute their ultimate success on this initial failure/s. There are a multitude to be found, from Charles Darwin, who was considered a very average student, and failed to finish his studies in medicine, but ultimately became one of the most famous and influential scientists of 19th century; to Thomas Edison whose teachers proclaimed him to be too stupid to learn anything; to J.K.Rowling, who, as a single mum living in extreme poverty, wrote the internationally renowned Harry Potter series. Learning to fail and pick yourself back up after a fall can be painful. But failure is inevitable and becoming proficient at managing and learning from these failures is a crucial skill for children to acquire if they are to succeed in whatever life throws their way. Daddy engineering – Building a heat exchanger! More Daddy Science – Purification of Sea Water! Love this perspective! I have a perfectionist child, and struggle to get him to try if he thinks he will be wrong. Just need to keep encourage ng and keep trying. Thank you so much for your comment. My eldest is also a perfectionist so I appreciate how hard it can be, but so worth the effort. Having written the post has actually helped me with my perfectionist tendencies too! At time 0 start both timers, and begin to cook the egg. At time 7, timer7 expires- flip it over. At time 11, timer11 expires. Timer7 now has 3min of sand on top and 4min of sand on bottom. So flip over timer7!